If magic exists it lives in a pot of chocolate. Like a cauldron of witches brew, the more I stir the more it bewitches me. The aroma, rising in rivulets like ghostly fingers, grips and pulls me in, deeper and deeper I fall under its spell. Hypnotic. Watching my spoon trace endless circles round and round the pot. And the colour! The deepest, richest, darkest brown. 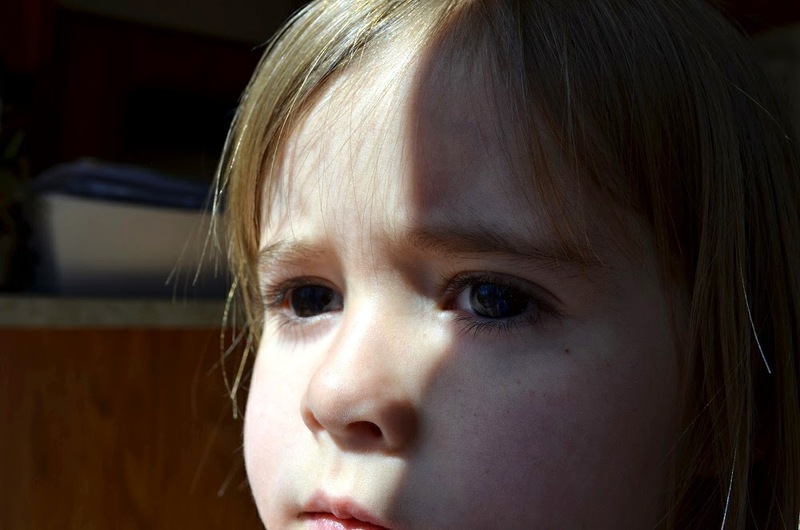 The very same, intoxicating colour of my daughter's eyes. It draws me in, beguiling, ensnaring. She has yet to learn the power she holds in those chocolate eyes. My daughter, in fact, has chocolate running through her veins. She was, after all, named after chocolate. Vianne, her middle name, after Vianne Rocher, the enchanting owner of the chocolaterie in Joanne Harris' novel, and my very favourite movie, Chocolat. And how very appropriate. It was for my daughter that I created this pie. As I sat at my computer last Friday, I was inundated with tantalizing photos of pie in my twitter stream and on facebook. They were, of course, in honour of National Pi Day (that mysterious number that defines the ratio of the circumference to the diameter of each and every pie plate, large or small.) As I scrolled through the recipes I realized, in horror, that I hadn't yet created a peanut-free, peanut butter pie for my chocolate girl! The tragedy! I had to come up with something immediately! 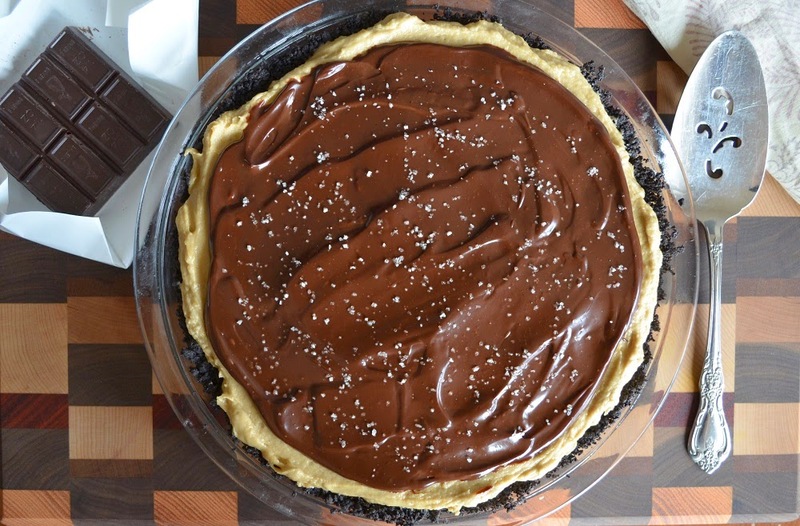 So with all these glorious images at my fingertips, I scrolled through the peanut butter pies, picking and choosing only the very best elements from each to go into my salted double chocolate sunflower pie. A chocolate cookie crust as the foundation. The best, organic sunflower butter, beaten with tangy cream cheese and a good dose of vanilla. Clouds of freshly whipped cream are carefully folded in, creating the most heavenly, pillowly texture. If this filling was a bed, I'd sleep forever! And the topping, the part I find most irresistible - pure, rich chocolate, gently melted into luscious cream and unapologetically smeared over the filling. And as if three truly decadent layers were not enough, let's not forget the sea salt. The finest French fleur de sel, still moist, sprinkled liberally over the warm chocolate like diamonds embedded into the darkest mahogany. Need I say more? Or are you as spellbound as I am? Preheat your over to 350 F (180 C) and butter a 9 inch pie plate. Place the cookies in the bowl of a food processor. Pulse until they are fine crumbs. Pour in the butter and pulse a few more times until evenly moist. Press the crumbs evenly into the buttered pie plate and up the sides. Bake the crust for 7 minutes. Cool completely before proceeding. In a large bowl, with an electric hand mixer, cream the cream cheese and sunbutter together. Add the sugar and vanilla and beat until well combined. In another bowl, with the whisk attachment, beat 3/4 cup of the heavy cream until stiff peaks form. Add approx. 1/3 of the whipped cream to the sunbutter mixture and stir in. Add the remaining whipped cream and gently fold until evenly incorporated. Spoon the filling into the pie shell and smooth the top. Refrigerate until firm, about 2 hours. When the pie is firm, place about 1 inch of water in a small sauce pan and bring to a simmer. Chop the chocolate and place 3/4 of it in a heat-safe bowl (reserve approx. 1/4 of the chocolate to be stirred in at the end). Place the bowl over the simmering water and stir in the remaining 1/4 cup cream. Heat gently, stirring constantly, until the chocolate is melted and fully incorporated into the cream. Remove the bowl from the heat and vigorously stir in the reserved chocolate until the mixture is very glossy. This tempers the chocolate, ensuring that it won't turn white in the refrigerator. 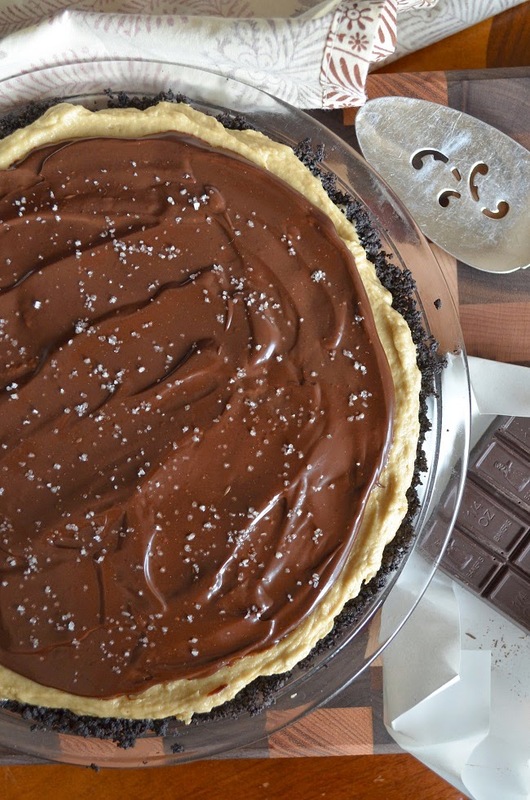 Allow the chocolate to cool slightly, then spoon it all into the middle of the pie. 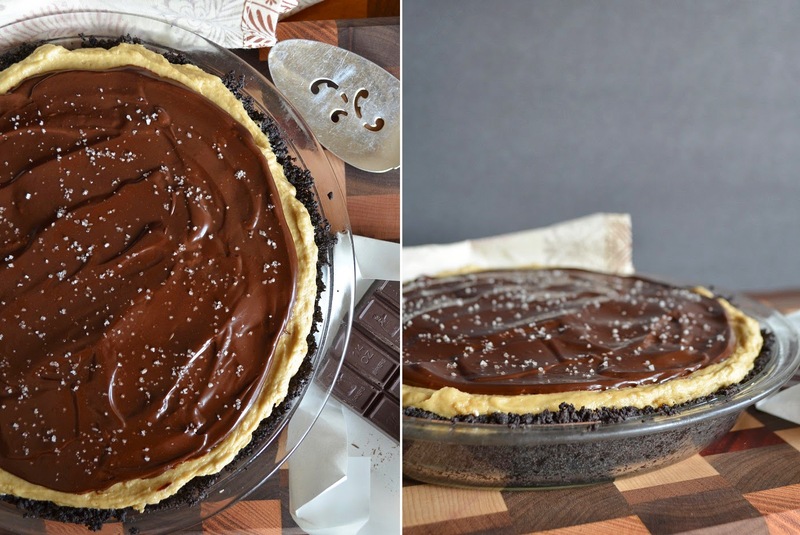 Using the back of a spoon, gently spread the chocolate over the pie to the edges. Sprinkle 1/4 - 1/2 tsp of salt over the chocolate (this is really to taste), and refrigerate until ready to serve. When you're cutting the pie, dip your knife into a tall glass of very hot water before each cut to keep the pie neat and the chocolate top from cracking. Serves 8. Check out these other sunflower butter recipes.